"I love the style and quality of your work. I love your hearts. Your creations deserve all the attention they can get and without a doubt they will be a blessing to many – at homes and churches." you've never seen anything like this in kids ministry before. we pinky promise. We provide a step-by-step walkthrough of how to teach the Genesis bible story to your classroom. This printable guide comes complete with scripture, discussion questions and activity prompts – all in one easy to use, handheld format – to let you know exactly what to to do on Sundays. We wanna make sure you get to have fun on Sundays! So we’ve created an EXTRA LARGE object craft you can easily make yourself. We'll show you how to integrate this object into your Bible Storytelling to spark curiosity in kids and help them quiet down and actually focus on your story! All you need are color + scissors + tape...for real. 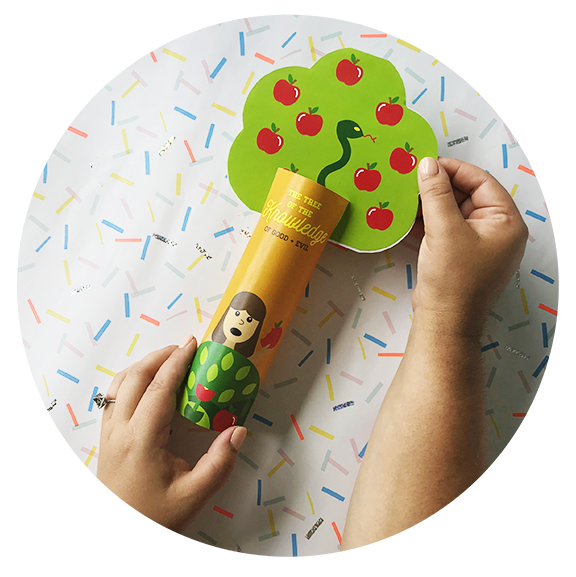 This pop-up craft is for all ages and will help your little makers understand + recall the story of Genesis 3. There's also a black and white version if your little makers love to color! We take the Bible seriously. And we know time spent in the Word is life-giving + life-changing. That's why we created this memory verse exercise so your little ones can start arranging scripture in their hands + planting it deep in their heart. We've got 3 Coloring Sheets and 1 Word Search as bonus activities in this bundle too! These help fill in any extra time you may have with your little ones before Sunday's over! You can even send them home with these to enjoy througout the week if you run out of time! You are so ready to teach sunday school without toilet paper rolls or popsicle sticks. Our deep desire is to raise up a generation of little disciples –armed with biblical truths. And what has God armed us with to achieve this deep desire? A passion for the Bible and a passion to create. We have spent over a decade hustling in our careers – Mr as an Art Director for Jordan, Nike, Puma, etc. Mrs as a Design Consultant for Louis Vuitton, Starbucks, Spotify, etc. Through our collective 20 years of industry experience and success, God revealed that creating is simply what He has made us to do. But the Jesus of the Bible is who we LOVE. So we decided to combine all our passions by designing crafts for kids ministry at our church. And we didn’t want it to just be another check off a box on the list of activities to complete on Sundays. We wanted to create a truly fruitful way of teaching the truths of Jesus through Bible stories (and in a way kids' busy minds and bodies could realistically handle). That's how Bible Craft Club came to be – our FREE ministry resource site of simple + original printable crafts. Soon, we were hearing from all corners that these crafts were giving kids a hunger for the Word! They were sharing what they learned with their siblings and parents. Plus they were able to visually share + retell these treasured Bible stories with our crafts! Our desire is not to hoard this glory for ourselves, but to pass on our successes and resources with you! So here are our new + exciting visual story-telling tools that we pray will be a blessing to all who thirst...to Make Little Disciples.